Hello, friends, I hope you are enjoying your day. 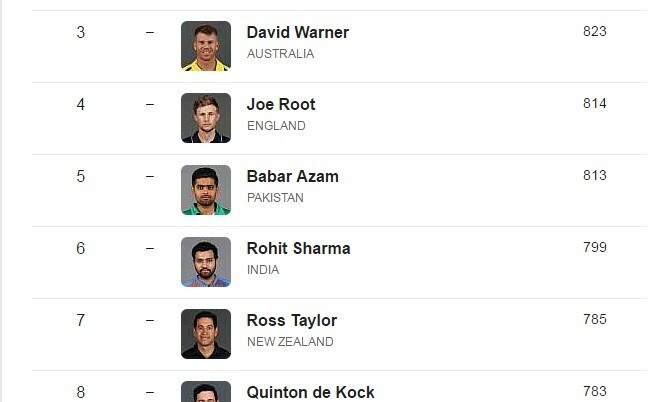 so today we come up with top international batsman for ODI we consist a list of top batsman in the world. these players are one of the best of all time and they are ranking on top in the world cricket. many people don't know about rankings of players so we are here with the list of players so here we go. The one and only man at this time in cricket India's pride and hole nations hope he's none other than Mr. Run Machine Kohli Yeah...... he is the man one of the best cricketer world cricket have after Sachin India has provided world cricket such a great talent and he deserves to top on no.1 rank so here is. Another guy we can also call him a run machine but we already have his nickname Mr 360 Yeah... he's on number 2 and deserves this number too honestly speaking if 1 number can approve 2 peoples then I will top this two guys on the list Kohli And De Villiers. But Bad News he retired from international cricket yeah you here right. Unfortunately, he is not playing with Australia at this time because of ball tampering but we..... fans will hope he will come back like a pro. warner got 3rd rank on world cricket but because of the ban, he is ranking can down but let's see what happen. So these are the three players who top the rank in ICC ODI INTERNATIONAL RANKING thanks for reading please share and visit us again for more. I am Abdullah signing off.